In October of 2013, former Pittsburgh Steelers wide receive Hines Ward became the first NFL player to complete the Kona Ironman Triathlon. To accomplish this, he completed a 2.4-mile ocean swim, a 112-mile bike ride and a full 26.2-mile marathon in a respectable 13 hours, 8 minutes and 15 seconds. His post workout recovery drink of choice after crossing the finish line…chocolate milk! As it turns out, chocolate milk is an excellent source of protein to help your body recover from physical exertion. It contains the right mix of protein, carbohydrates, vitamins, minerals and liquids to refuel your body and repair your muscles. Best of all, it’s absolutely delicious! Many athletes know that protein is a key energy nutrient that can aid in muscle building, muscle recovery, and vital bodily functions. Some protein-happy athletes take this idea to the extreme and chug down huge protein shakes after every workout without truly understanding how protein works in the body. We are going to take a closer look at protein’s role in muscle development and recovery and explain why chocolate milk can be an ideal source. Next time you are ready for your post workout recovery drink, you should skip the expensive supplements and just pick up a cold glass of chocolate milk. Each time you take a bite of chicken or drink a post-workout shake, the protein enters your body ready to go to work. Dan Benardot explains in his book “Advanced Sports Nutrition,” that this protein is first digested down into its amino acid building blocks before being rebuilt into proteins that your body uses for various important functions. To start, protein is a vital source of carbon that is used by your body for energy yielding reactions. It also controls the water volume in your blood and body tissues, transports substances like iron within the blood, is synthesized into hormones and neurotransmitters, helps the body maintain proper pH levels, and forms enzymes that are involved in many digestive and cellular processes. Athletes are most concerned about protein’s vital role in building and repairing muscle tissue along with organs and bones. For example, you’ve likely experienced extreme soreness after an especially tough workout. Consuming protein after your workout can reduce this pain. A September 2007 issue of the “Journal of the International Society of Sports Nutrition” reports that protein consumed after resistance training can reduce symptoms of delayed onset muscle soreness (DOMS). Protein accelerates the healing of tears in muscle fibers following a tough workout. So how much protein should you consume after your workout? An article in the American Journal of Clinical Nutrition recommends that you ingest 20 g of protein after your work out. Don’t get fooled into thinking more is always better. According to Dr. Rob Danoff of the Aria Health System, your body – especially your kidneys – can only handle so much protein at one time and consuming more than the recommended amount is not advised. The best source of protein for post-workout recovery should come from high-quality, whole foods like milk, beef, fish, chicken, beans, or tofu. (Notice I included milk on this list!) These whole foods also supply essential nutrients necessary for basic health and sports performance. If you are looking for a powder supplement form of protein, you should again look to cow’s milk for the answer. Whey protein is an especially effective and fast-digesting source of protein that is formed from cow’s milk and usually sold in powder form. According to the Whey Protein Institute, whey protein “provides a high concentration of branched chain amino acids (BCAAs) to maintain and repair lean muscle tissue following exercise and to prevent muscle breakdown.” Benardot adds that whey protein is best combined with a source of fast digesting carbohydrates which can help accelerate the update of protein by your tired muscles. 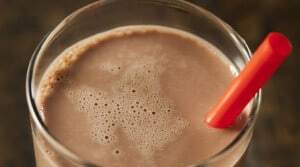 Chocolate Milk – The Ultimate Post Workout Recovery Drink! Now that you have a better idea of how important protein is as part of your post-workout recovery plan, let’s take a look at the true star of our story…chocolate milk! Hines Ward is a huge fan of chocolate milk for muscle recovery for good reason. Low-fat chocolate milk is a natural source of high-quality protein, which can help build lean muscle. It has the right carbohydrate-to-protein ratio that is shown to refuel and rebuild muscles. In addition, chocolate milk has vitamin A, electrolytes, and vitamin B for energy. Best of all, chocolate milk contains bone healthy ingredients like vitamin D, phosphorus, protein and potassium. Multiple studies have reinforced the notion that chocolate milk is a great drink for recovery. An article in the International Journal of Sport Nutrition and Exercise Metabolism found that “chocolate milk is an effective recovery aid” for cyclist training at high intensities. Researcher E. Cockburn showed that subjects who drank regular or chocolate milk experienced less exercised-induced muscle damage than those who drank typical sports drinks. Another study of eight male runners showed enhanced skeletal muscle protein synthesis after drinking 16 ounces of fat-free chocolate milk compared to runners who only drank carbohydrate heavy drinks. This indicates that the muscles were better able to repair and rebuild. Next, a study showed that whole protein consumption from milk can stimulate muscle protein creation after resistance exercise, which can lead to increased muscle size and strength. Finally, researchers decided to compare the powers of whey protein to another popular protein powder supplement from soy. Results showed that milk consumption after exercise resulted in a greater net protein balance and an impressive 34 percent more muscle protein synthesis when compared to soy. Be aware that not all chocolate milks are created equal. When choosing your brand, be sure to take note of the fat and sugar content in your drink. All of the studies I mentioned here specifically mention low-fat chocolate milk as the best choice. If you are looking for an even more delicious way to enjoy your chocolate milk after a workout, try adding in a spoonful of peanut butter to create a chocolate peanut butter cup drink. Or, you could blend in some strawberries for a fruity twist. Finally, you could try heating it up and enjoying a hot drink to warm yourself after brisk fall runs outside. The possibilities here are endless…and tasty. Convinced yet? Chocolate milk contains the vital protein needed for muscle recovery and strength increase while feeding your body important vitamins, minerals, carbohydrates and fluids. It is a smart and delicious way to end your workouts! Learn more about Active Recovery techniques that can help after a hard workout.